To help local businesses grow their online web presence and help them get more and more customers. Basically, we are in the business of helping businesses, and it is our goal to help as many local businesses expand and succeed as possible. With the technology available today, it is extremely important that your business not only have a website, but one that is available to all customers no matter what type of device they are using to search for your products and services. Do you have a website? If yes, does it work on a smart phone or tablet? Does it make your business look trustworthy and like someone a customer would want to contact? Can people even find your website? If you need help with any of these situations, contact Say So Marketing immediately! Say So Marketing is a team of ‘Web Geeks‘ that eat, breathe, and sleep all things related to internet marketing. From website design, to search engine optimization, to social media and PPC advertising. We know it all and how to apply it to your business. 1) Free Website and SEO Analysis – We just need your website URL and a little information about your business and we will run a complete and detailed analysis of how your website and online presence stacks up. This information is extremely valuable to see how you are currently positioned and how your competition is positioned and what it will take to increase your positions. 2) 20% Off* Website Designs and/or Makeovers – If you need a new website, or to upgrade/convert your existing website, we are offering 20% Off discounts to those that mention this offer. We will consult with you and explain all the available options to you and get your new website up and running. 3) 10% Off* our marketing packages – Just having a website is the first step. From there we offer marketing packages to help increase your web traffic, covert that traffic into leads and sales, and retain those customers and keep them coming back. Our services can include Social Media and PPC Marketing, as well as SEO and Local Search Optimization. 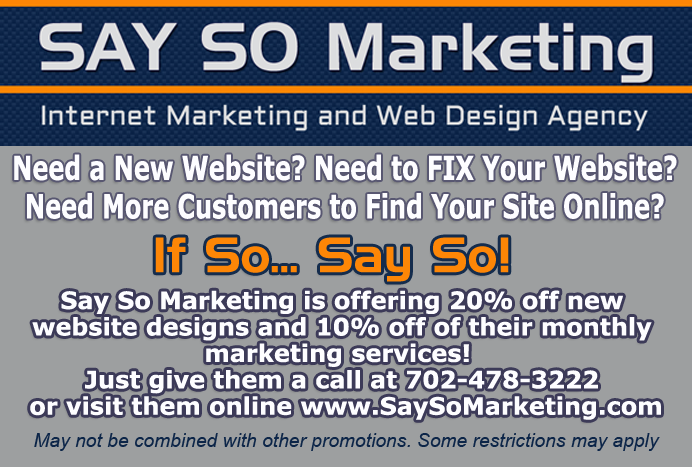 To get started you can call Say So Marketing at 702-478-3222 or go to www.SaySoMarketing.com and get started online.